The Rose Fitzgerald Kennedy Program to Improve Catholic Religious Education for Children and Adults with Intellectual Disabilities. 1-877-275-4725. Symbols Teach And Reveal Sacred In Secular. A Creative Symbols Workbook of the Rose Fitzgerald Kennedy Program. Call Office for Ministry with Persons with Disabilities for information 610-289-8900 X 2280. A Power Point program especially helpful for children with Autism Spectrum Disorder and/or Intellectual Disabilities in which you may individualize and print your book by following the picture reference included to add digital photos of your parish church, priests and parts of the liturgy which can be used for instruction. Contact: Office for Ministry with Persons with Disabilities, Diocese of Allentown, PA, 610289-8900 x 2280 or jjohnson@allentowndiocese.org. Guidelines for Christian Education in Sexuality and the Family, Diocese of Pittsburgh, Secretariat for Education. by Dr. Joseph White and Ana Arista White, Our Sunday Visitor Publishing, 2002. Offers insights and methods for accommodating unique emotional and behavioral needs in the classroom. Available from Our Sunday Visitor, 1-800-348-2440 or www.osv.com. Prayer Services with Persons with Severe disabilities by Fr. William Gillum, OFM Cap. Available from: Author House, 1663 Liberty Drive, Suite 200, Bloomington IN 47043, 1-800-839-8640 or www.AuthorHouse.com. Or book order hotline 888-280-7715, bkorders@authorhouse.com. Activities for Children, Teens and Families by Joann E. Davis. The book offers children at home or in a classroom setting an Understanding of what persons with disabilities go through everyday. Over 50 pages of mazes, puzzles, coloring sheets, beatitudes of acceptance, Saints with disabilities, Braille, signing pages, and more. Joannedavis22@hotmail.com or 1-517-787-1189. We Go To Mass (geared for children with autism). Deaf Apostolate, Archdiocese of Philadelphia, pcpddeaf@adphila.org, 215-587-3913. A Resource for Deaf Ministries (video) produced by the Deaf Ministry Offices of the Archdiocese of Washington and Baltimore, 2008. Available from the Center for Deaf Ministries, Archdiocese of Washington, 301-459-7464, adwterprequest@aol.com or Deaf Ministries for the Archdiocese of Baltimore, 410-347-0704, ecolarusso@archbalt.org. Large print Lectionary and Sacramentary available form the Office for Ministry with Persons with Disabilities, Diocese of Allentown, jjohnson@allentowndiocese.org or National Catholic Partnership on Disability, www.ncpd.org. 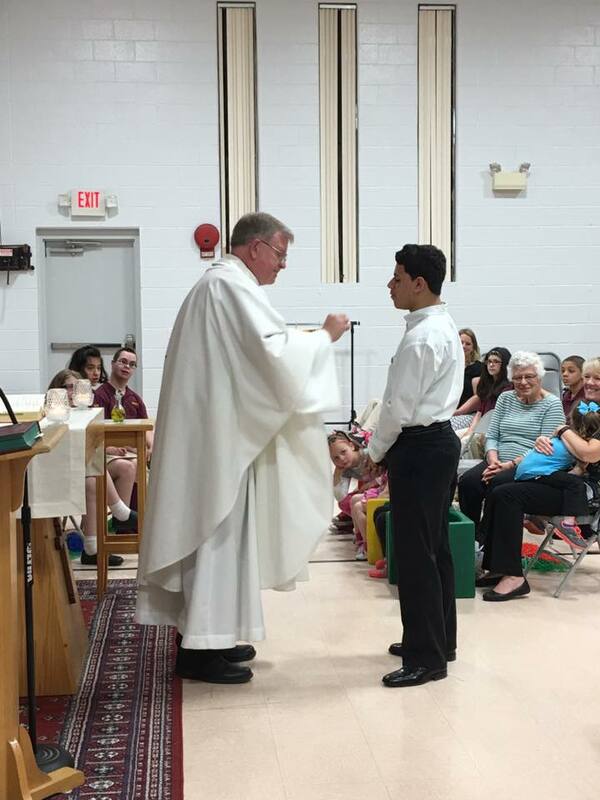 D’Angelo Lopez received First Communion from Fr. Winne on May 12, 2017.